7 years ago, we were elated and terrified to welcome the first of our three little readers into the world. As parents, we don’t do a lot of things right – Breslin’s gone to school with his pants on backwards enough times to verify that. But, we have managed to turn out three little people who love reading fiercely. Here are some of our thoughts on how we have helped to foster and nourish that love in our home. Our oldest isn’t one to go the bookshelf and pick up a book. He’s not the type of kid that you tell to go and read a book. What we’ve found is that if we have books laying around all over the place (tables, floor, car, bed, etc) he reads a ton. Sometimes he’ll find a book laying on the coffee table and read it cover to cover. Yesterday we cleaned out AJ’s loft bed and found close to 40 books. They were jammed in between the mattress and the frame, crammed under her pillows, and wedged under the comforter at the foot of the bed. And don’t even get us started on the van. The book explosion that seems to follow us wherever we go is worth it because it means that our kids are more likely to read something no matter where they are. Our kids are always seeing us with our noses in books or are hearing us talk about books. We would probably be embarassed to admit how many times we have responded to one of their requests for a snack or a drink with, “As soon as I finish this page.” We both read before bed, we read at the beach, and we read in the car on long trips. Seeing us choose reading as something we do for fun or for relaxation helps them to see how valuable and important we view reading. 3. Celebrate books and acknowledge authors as the rockstars they are. Most people that are members of the Nerdy Book Club think authors are rockstars and they celebrate books daily. We take our kids to bookshops to meet authors, we take them to comic festivals, and we get excited when new books enter our home. When they grab their nightly boobook before bed,they are always asking if we have any new books. We want our kids to know that new books are always coming out, and we want them to get excited when a new favorite joins our family. 4. Give books as gifts. What’s worse than getting a bunch of plastic junk for your kids’ birthday party? How about knowing that you are contributing to the plastic junk of other people’s kids? We have made our lives infinitely simpler by making a conscious effort to give books as gifts to both our own kids and to others. When we set out to purchase a gift, we let the kids pick a book (or two or three), which is a decidedly entertaining process. Which Elephant and Piggie book would Mia like the best? Can we get the Penny stuffed animal to go with Penny and Her Song for Mary? Would grandpa like a book about football for Christmas? Of COURSE. Giving books as gifts shows our little ones that books are precious and that our favorites are worth sharing with others. Nobody wants to read the same book every night. Yes, we did read Penny and her Song at least 185 consecutive nights, but our kids still need to be flooded with new books as much as possible. We’re always putting new books in front of our kids. We rotate the piles around the house. We clean out the books from the van and they are gradually replaced with different ones. The books we get from the library go straight into their cute little hands. When we see our old favorites, like a Calvin and Hobbes anthology at a garage sale, we pick it up and let them try it out. We never quite know what they’ll end up with, but the bottom line is that they always end up with something. You don’t have to be RIGHT THERE next to your kids for them to read, even if they are really small. 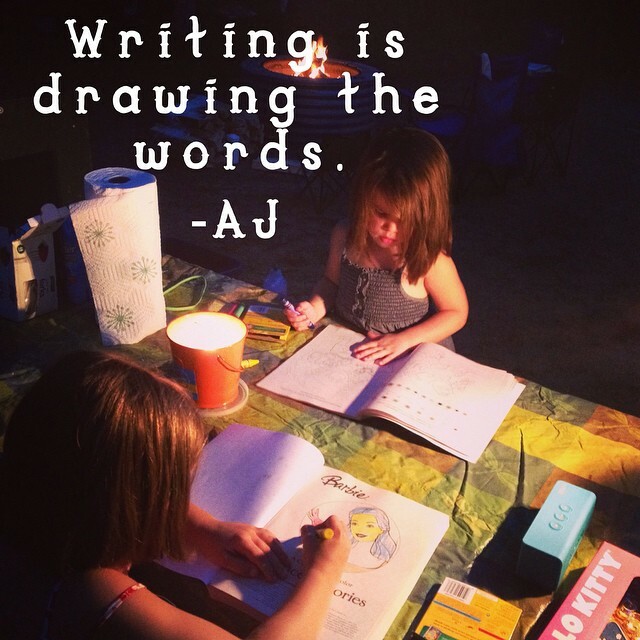 We both have vivid memories of AJ sitting with a picture book in her high chair while we made dinner, entertaining herself by just looking at the pictures in a board book or making up her own words to the story she saw unfolding in her hands. As a parent, a lot of times we worry that our kids will mispronounce a word or form bad habits if we aren’t there to guide them, but it’s simply not true. Think of how much more your kids would be able to read if they didn’t need you right there all up in their business. And when they can do it by themselves, they are beginning to see how reading is something that can be fun and rewarding even if they are all on their own. 7. 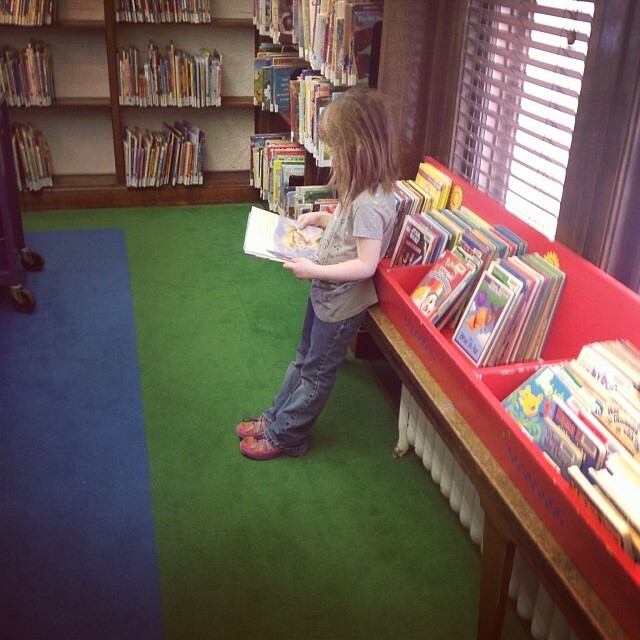 Let “going to the library” be more than just checking out books. Just like going to see a movie, visiting the museum, or a trip to the bounce house, going to the library is an event. The kids equate a trip to the library with a fun adventure out of the house. We don’t force them to pick out books, and we don’t say no to any books they want to get. We let them play with the puppets, tea sets, and puzzles and we participate in the crafts and activities. It’s not a chore or an obligation, but an entertaining privilege — each time a visit is suggested, it is met with cheers from our little posse. 8. Help them find books that align with their interests. This one might seem super obvious, but pulling it off is harder and requires more self-sacrifice than it sounds. Sure, Breslin’s love of Legos made it easy to pick up a monster volume of Lego history, but when AJ went through a phase where all she wanted to hear was Caillou or when the girls were obsessed with the encyclopedia of Lalaloopsy, we had to grit our teeth and take one for our tiny team. Kids don’t always want to read award-winning literature, and that’s okay. There’s a reason they like the things they do and reasons they want to read the books they choose. We might not see the appeal of the Barbie Ballerina book, but those girls will read it non-stop. We call that a win. One of our biggest reading fears is that our kids will ever see reading as a chore.So, we don’t make our kids read. There are no bookmarks with timers on them, and we don’t have a set time during the day when we read. We’re busy. A set time would be setting us up for failure. We surround our kids with books, we read all the time, we celebrate books and do all sorts of other things to get our kids reading. But, our kids like to watch television too. We let them watch. Our oldest is obsessed with video games. We let him play. Reading is a very important things in our family, but it isn’t everything. We have a nice little bedtime reading routine at our house. The kids brush their teeth, put on their PJs, and pick a couple of books to read with us before bed. They don’t have to read, but the only other option is to head to bed. They always choose books. 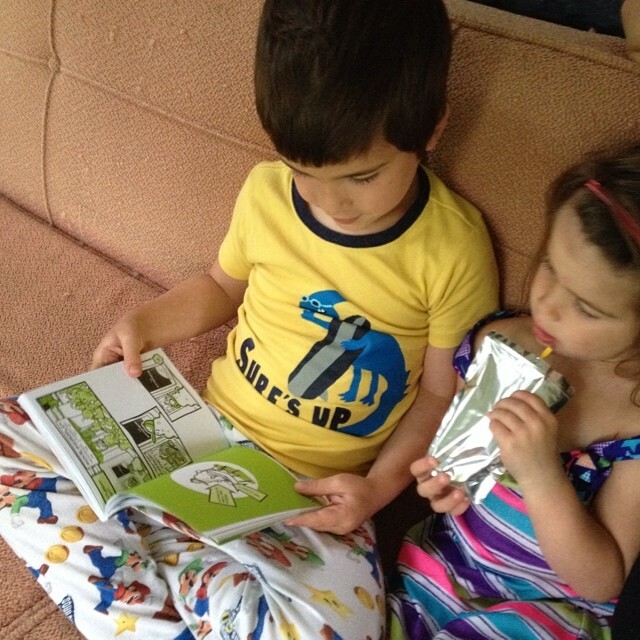 After reading a pile of books we tuck the kids in and leave them with their books. They fall asleep reading, holding, and cuddling a handful (or sometimes a bedful) of books. 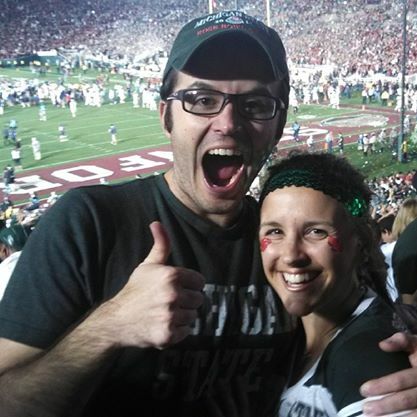 Alaina and Colby Sharp are teachers in the Parma Western School District. They have three book loving kids. Their fourth child is due tomorrow. You can follow them on Twitter at @sharpsgalore and @colbysharp. 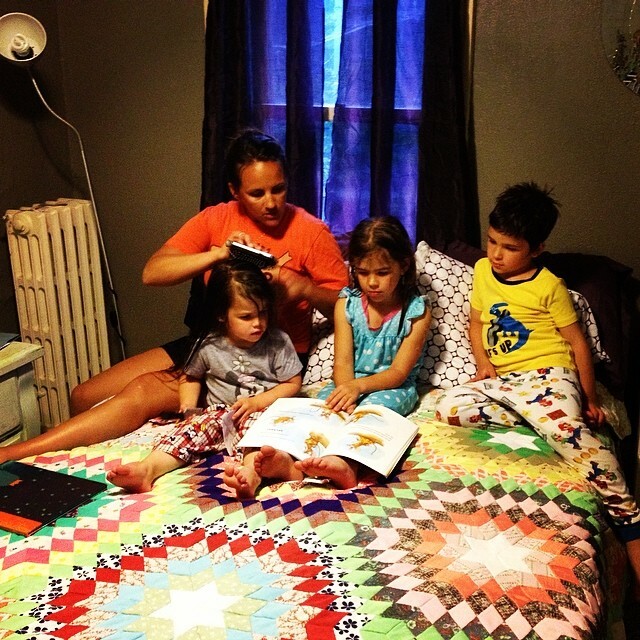 I think your four kids are very lucky to be immersed in a book and people loving home! It’s not what we TELL kids to do that they will remember. It’s what we model and do every day of our lives that informs their life long thinking. I enjoyed this so much! I have three kids and books are such an important part of our family fiber. I feel like some of our favorite beloved characters are part of our family. I am often asked how to grow readers…. I love your beautiful response! Good luck with number 4! All best wishes as reader #4 enters the world! This is fantastic. I am going to share this article and a book with all my friends who are parents this year. Today is thanksgiving and I woke with no electricity but I am thankful for nerdy friends like you who remind me that with a woodstove and books we are all ok today. Thank you. This is one of my favorites. I keep typing responses, and these comments are turning into a blog post of its own. 🙂 So, I will just say, thank you for sharing your family of readers with us. 🙂 Blessings on #4! Safety and Joy for Everyone! Well done, Mr. and Mrs. Sharp! Congratulations on your family of readers. 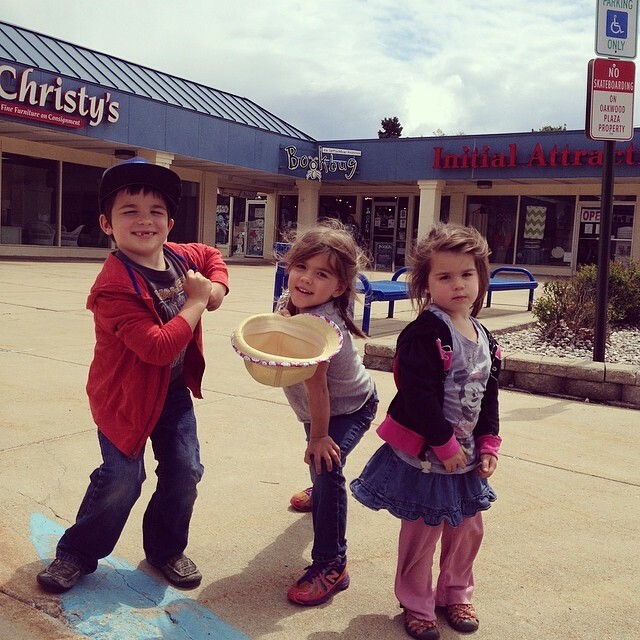 This post is so touching and brings back memories of raising my own 2 children. We never planned it, but did pretty much the same thing! I can even add bathtub books – I think they were by Richard Scary and made of of plastic. One of my favorite memories is visiting book stores (or libraries) and having my son or daughter ask, “Is this where we buy them or check them out?” We certainly didn’t have much money but there were always tons of books everywhere in our home too. I hope that every young family reads this post. Thank you for sharing and best wishes on adding another reader to your family. My children grew up like this, so I hope they will pass book love on to our grandchildren someday. I hope I instill this love of reading with my students. I will return to school on Monday with a box full of books and a camera full of author pictures from NCTE. My students think I am so famous. Wish I could’ve met you there, but I understand you two are busy these days waiting for #4. All my best to you and your family this Thanksgiving Day. Thanks for sharing, and good luck with the new bundle of love! When my kids were little and they were asked to write and draw pictures of me for Mother’s Day projects in school, they always wrote or drew a picture of me reading a book. I was the mom who had no problem saying no to new toys, but was a complete pushover when it came to new books. Well, it paid off. My daughter is now a freshman in college and studying to be a teacher. She called me a few weeks ago and told me that she missed reading for fun and she bought some books and kept sneaking away to read in her dorm room. I’ve had my share of Bad Mummy Awards, but after that conversation, I felt like I deserved a Good Mummy Award! P.S Wishing you a joyous Thanksgiving and smooth sailing with the birth of number 4! 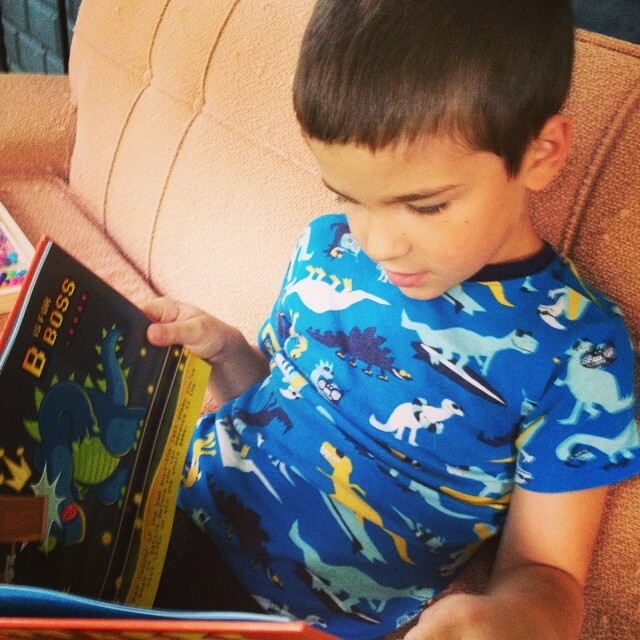 I don’t usually re-post writings from other bloggers–but this post from the Nerdy Book Club about raising readers is so wonderful that I just had to share it. Enjoy! And to my American blog buddies, I wish you a happy Thanksgiving holiday! One great idea to start them off with a lifetime supply of books is to have the baby shower be focused on books. Everyone brings a favorite book from childhood to share with the newest addition. My kids then got a new library full of books to enjoy from birth through the various stages of childhood! Welcome to reader number four! What a great post to read. Reminded me of reading with my kids – the tears and fears and laughter as we joined so many great character on their adventures each night before bed. A family of readers is wonderful thing! Happy Thanksgiving and Happy Reading! One thing that struck me reading this is the complete happiness and fun that surrounds every idea and picture. What kids wouldn’t love books with that combination. Also my very literate son was known for going to school with his pants on backwards. He had more interesting things on his mind. 🙂 Happy Thanksgiving! A very Happy Thanksgiving to you both–and all best wishes for the imminent arrival of the baby. Thank you so much for this terrific post. I’m going to share it with two couples who’re expecting their first child(ren) in mid-December. Happy Holidays! What a great post. I am thankful for all little readers and those who make books available to them and to people like Colby and Alaina that light the way. “Each day a thousand treasures come to me with every passing moment.” Enjoy your Thanksgiving baby. My twenty-one year old son is an avid reader, and I followed many of the steps you outlined. I must have read “The Pokemon Handbook” at least a hundred times.I think it’s all about making reading fun. Congratulations on your soon to be new little reader! This was a wonderful post. Your fourth reader is due? How wonderful. You obviously do more than read books. I loved this post. It is so “real”, as opposed to the Pollyanna advice we often read. Love this post, Colby and Alaina, and that you wrote it together. I will be sharing this with the parents in my classroom. Happy Thanksgiving, and best wishes on the arrival of Reader #4! I loved reading this–like a Thanksgiving love letter to books! Congratulations on the new baby! I triple-time loved this post, Friends. I’m going to pass this on to all of my new-parent friends who want to make good choices for their kids but don’t know quite what to do next. We all make mistakes, but you two (you six! Welcome, Little Hobbes!!!) are doing a heck of a lot right! Thanks for giving me some terrific tips for when I have my own littles someday! 🙂 Happy Thanksgiving! Loved your suggestions. One thing it reminded me of is the sad fact that many children in America don’t even have one book in their homes. Can you imagine, not having even one book for your child? It sounds like your kids have a huge leg up, by being exposed to literature daily. This is the best advice I’ve ever heard about kids and reading. And congratulations on little Hobbes! i just kept scrolling and smiling, smiling and scrolling 🙂 Thanks for sharing, Colby! This is a truly inspired list to teach children to love reading. I wish I had it years ago. Best wishes to you. Congratulations on #4. I pray your message reaches all young readers, somehow, someway. I love this post so much! It’s inspiring and real. Makes me think about the messes of books all over our home in a much brighter light! Your kids are beautiful. Wishing you the best on #4! I love this because it describes my home and three daughters too! Great post. Congrats on #4 … another great reader I am sure of it!! 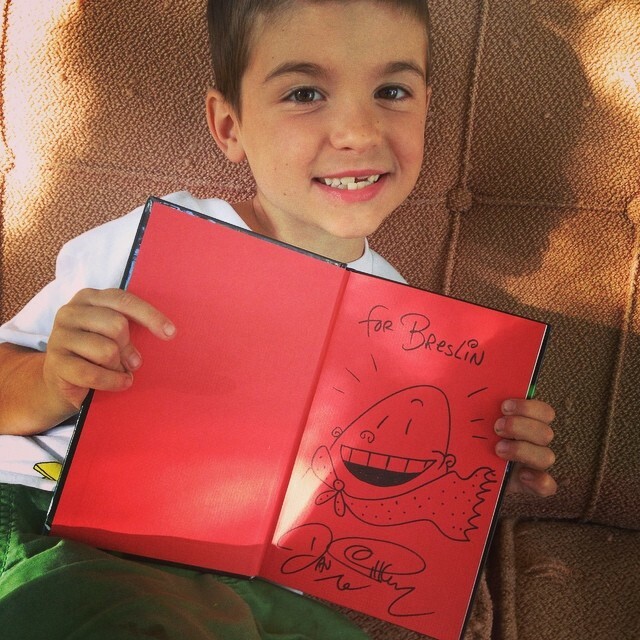 Raising awesome readers comes naturally when you give the gift of books and spread them around your home with love. Thanks for helping to spread the message on how easy developing a love of books and literacy can be when you model reading daily and allow individual choice. 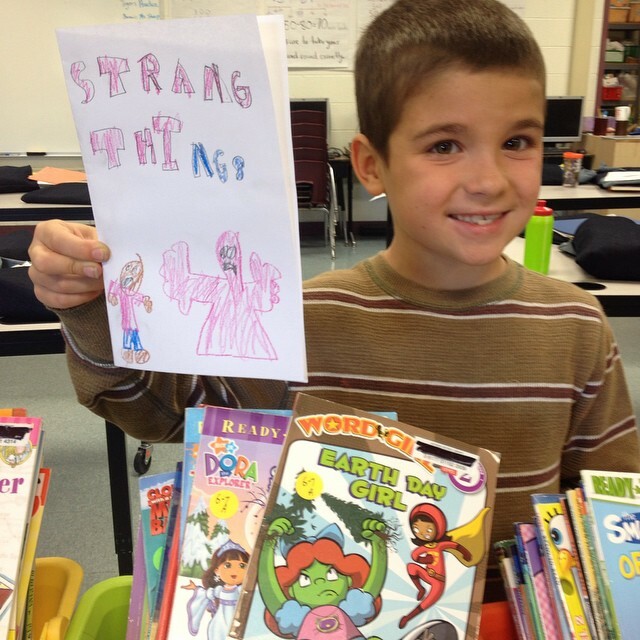 Have you ever thought about becoming a reading teacher or reading specialist? I See these not only being good things to do as parents, but these are the basic things that all teachers need to be doing to encourage reading within their classrooms. The list is basic, cheap, and requires essentially little to no planning by the teacher. 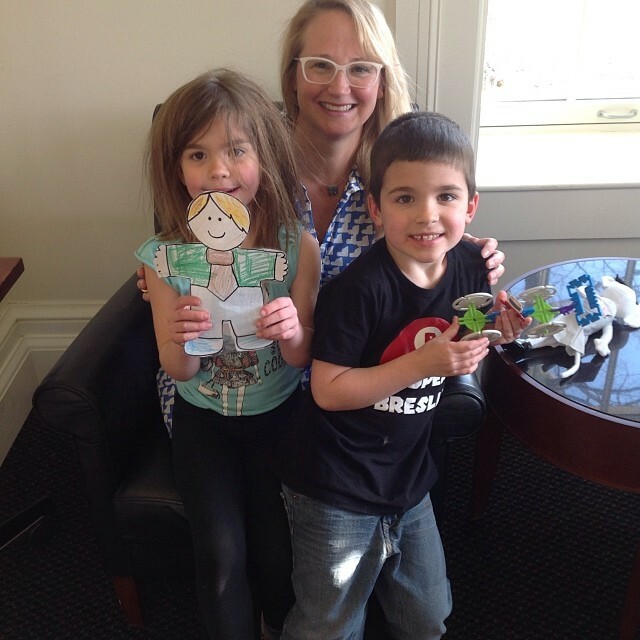 Celebrate books and authors – My class just got done reading the book Flat Stanley and now students are making their own Flat Stanley’s, sending them on their own adventures and asking someone, somewhere else in the world to take Stanley on his next adventure. I think that letting children see us read is crucial. Every once in a while, I carve out time in our independent reading time and I take out a book and just read. I laugh, I cry, and I get excited about what is happening in the story I am reading. I also tell my students that I am reading a book right now, and I can’t wait to see what happens next and so I am going to read with you during our independent reading time. This shows students my love for reading and the love becomes contagious. I also love giving books as gifts. Every winter break, I give each child a book to read over the long break. I also try and find a book that interests each individual child. When students are engaged and motivated, they will read! Thank you for sharing this article. It serves as wonderful advice for not only parents, but teachers, and anyone else reading. (These are rules not only for young readers, but any reader). 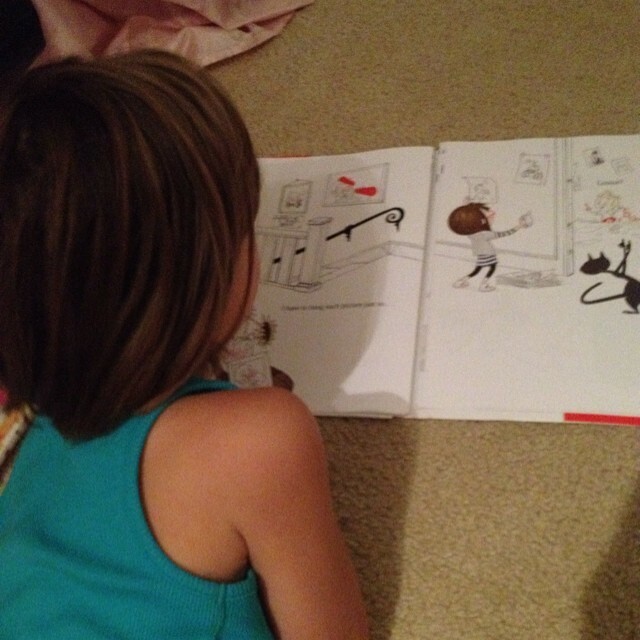 I love how you are modeling your passion for reading with your children! I connected with many of these ideas as things I do as a teacher and as a reader. As a reading teacher, “never force it” is advice I am always giving to my students’ families. We work so hard on the fundamentals of reading during the school day, that reading at home should be about engaging as readers and keeping the joy of reading alive. When I’m not into a book, I can set it aside and come back to it later – or return it to the library unfinished. Of course we should allow our children to do the same. I love the idea of giving books as gifts, especially because it leads to entertaining conversations about books and book preferences. My sister-in-law and I have been giving books as Christmas gifts for the past few years, and we’re slowly converting other family members to the cause. How to Stay Alive in the Woods is going to my future bother-in-law this year since he survived a family vacation to the Boundary Waters over the summer. When you give a beloved book, it’s like sharing a bit of yourself. As a result, our gift exchanges have become more personal and less commercial. 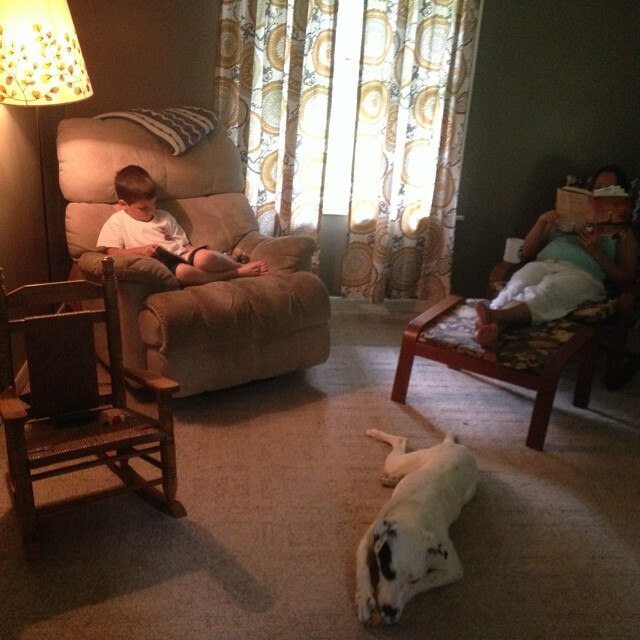 I have two sons and I struggle to get down to LOVE to read. both of them have ADHD and I am afraid that reading is becoming a chore in my household unless I am the one that is doing the reading. I love it when I read to them but having to put in the work to read themselves is something that they don’t want to do, my husband never loves to read however I do. Any suggestions?